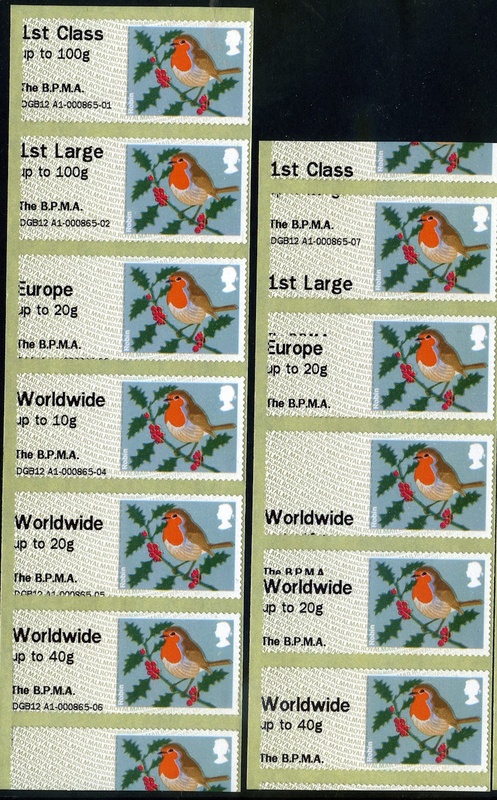 BPMA Faststamp slippages - Stampex all over again! 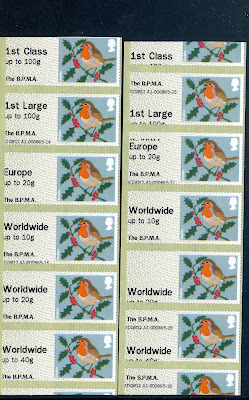 Richard has sent a couple of pictures of mis-fed BPMA Robins. "this is how they came out of the machine no tugs no interference, no putting in another lot, while the other ones are printing no skullduggery whatsoever" which was all witnessed by a technician who was there showing BPMA staff how to reload the machine. Update: A video of the original Stampex Cattle long strips has now been added to the first report, demonstrating that there was no interference with the machine. No, a new roll that just didn't feed properly from what I understand. There may not have been any interference with the machine, but I would still argue that these are not "errors" in the true sense, since they have arisen at point of sale. Someone needs to set a moral standard with these, my own humble opinion is that a true error on a Post & Go stamp should only be on the pre-printed part (eg. short phosphor band etc). I know several collectors and dealers who concur. I note that blank labels are appearing on ebay now as well, no doubt the PO or Royal Mail anti-fraud people will have something to say about that. Caveat Emptor, as they say. I totally agree with you, there aren’t many morals left in some stamp collecting circles these days. Whatever happened to quality control? I’m sick and tired of the new release’s scarce/rare blah blah nonsense on fleabay, it’s the typical cash cow crap whether it’s PO or unscrupulous people/dealers taking the money and its happening most the time now. Very sad time's ahead..
Every variety that appears on Post & Go naturally from a machine has some merit, so their can be no moral standard. At the point of sale is what makes Post & Go, better more interesting and more postal than most stamps. Pick what you like, leave what you do not. Unless a single machine was issuing P&G with slippage or 'typographical' error over a significant period of time, it is unlikely that these errors would be catalogued. Certainly the one-offs will remain undocumented, as there will be a vast number of them. If one wanted to collect P&G it would perhaps make sense to have one example of slippage and/or a lateral off-set type error to illustrate the possibilities, but it would not be possible for any collection of P&G errors to be in any true sense 'complete'. Does anyone know what TRUE errors exist on the P&G series since their inception? By this I mean errors solely on the base printing undertaken at the security printers and NOT on the thermo overprint. As recorded here, overprints are open to too much "creative interference" by staff (who are surely committing a disciplinary offence?) and "ethically challenged" collectors. There is absolutely no suggestion that the technician attending this machine was instrumental in creating this misprint. I understand the same thing happened at Stampex when only customers were at the machine - and the misprint is very similar. Regarding the actual errors on the base stamps, the only one that I know if is where the perforation is shifted downward by about 1 mm. The background printing is missing between the stamps, and this created a white gap at the bottom of the stamp wrongly described as 'background printing missing', implying a fault with the printing when it was just a slight misalignment of the perforation. It would appear that someone may have been "pulling" the Hytech labels as they were being dispensed from one of the kiosks. Something similar happened about a year ago. This resulted in a modification to the kiosk at Spring Stampex to prevent this re-occurring. However, the new kiosks at Autumn Stampex did not have this modification. You are perfectly correct. The earlier Hytech machines at Autumn Stampex 2011 did produce similar strips when customers pulled the strip as the printing was taking place. The machines were modified for Spring 2012 and the proplem was cured. 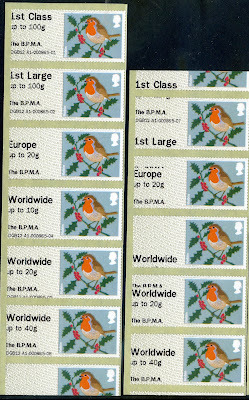 The Version 2 machines at Stampex 2012 produced a similar error with no interference. And the error shown here ocurred on a customer order, while the technician was standing watching, with no possibility of any interference by either. The new Hytech machines in use at Autumn Stampex, Perth and now at the BPMA all have the modification to the machines that prevents the strips being pulled out by hand. The part where the stamps are delivered has a perspex strip that has to be pushed in to get the delivered stamps out which in turn prevents the next strip of stamps from being pulled out. These new Hytech machines also work very fast and I don't think one would have time to do anything except gather up the stamps and receipts which also come out very fast. 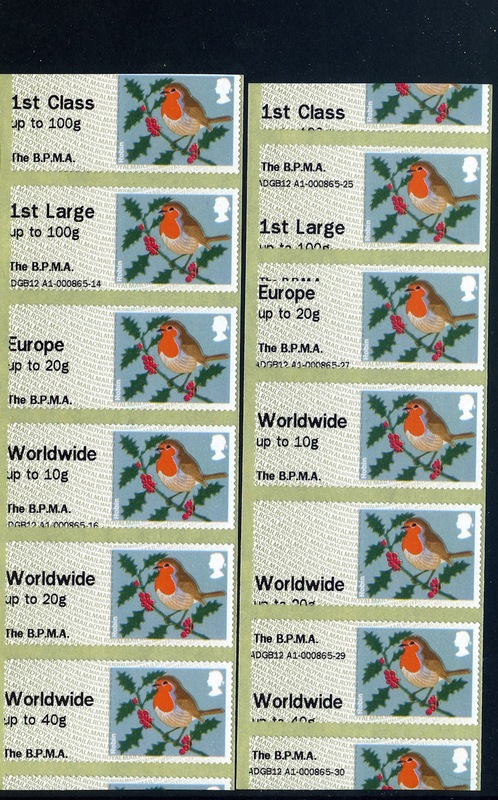 Looking at the Robin stamps that are shown at the beginning of this blog I don't know how anyone can call them anything but errors. Surely if Royal Mail had intended them to look like this they would have produced them themselves. As someone said earlier in this blog 'Pick what you like, leave what you do not'.